1. I’ll be nice to use if you are nice to me (naive reciprocity). 2. vengeance is mine if you cross me. 3. I’m invincible and can weasel out of lie my way out of any situation. 4. Naive world view: Nuclear weapons are a deterrent, not an active means of military force or foreign policy. 5. Adolescent speech pattern that is often grammatically incorrect or uses words not in the English language. Drumpf behaves like a petty small business tyrant in the White House. He rules by intimidation, and many of his staff have been fired or resigned. Because of this he has not been able to attract first rate talent to his administration. Drumpf's management skills are marginal. Suspect he had left management of his business empire to his family and immediate staff in the Trump business organization. 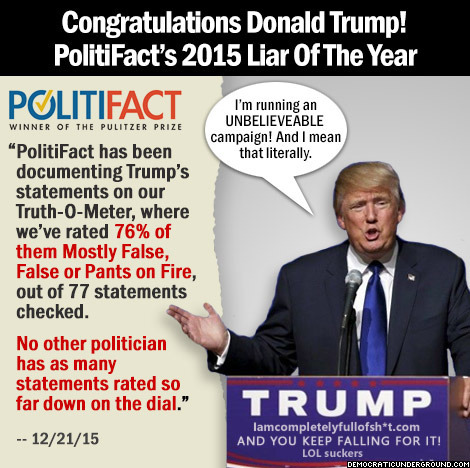 Drumpf constantly lies—about 5 lies per day—according to the Washington Post and is considered politically unreliable in the US House and Senate. He doesn’t know when to quit when caught in lies. The La David Johnson situation is a good example. The wife of La David Johnson, the father of the young fallen man and a US congressman all agreed that Drumpf handled condolences in very ham fisted way. A simple apology would have done the trick. A week alter Drumpf is still saying he is right and the Gold Star family is wrong. Very stupid, Mr. President! Is Drumpf intelligent? Relative to Presidents I can recall starting with Dwight B. Eisenhower would put Drumpf at the very bottom of this esteemed crowd. We really have no information on Drumpf’s IQ. By the way, IQ is a concept that is widely debated in academics. We don’t even have transcripts of Drumpf’s high school or college grades. No ACT or SAT scores either. We do know that Drumpf got into Wharton under grandfather rules, not based upon his academic merit. Donald Drumpf was the dumbest goddamn student I ever had. 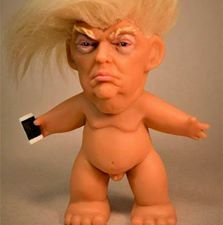 Is Drumpf a narcissist, a sociopath or a megalo-maniac or perhaps all three? We do know that Drumpf always think he is right, which doesn’t work well in the world of politics and compromise. rumpf has had similar problems with the judicial branch because he has signed executive orders that are at odds with public law. His executive orders on immigration are an example. The Democrats have also hauled him into court for his attempt to cut coprolite subsidies for the Affordable Care Act (ACA). Of interest, conservatives are certain those authoritarian Americans “are leftist, young folks.” Really? Haven’t noticed any “leftist, young folks” marching with torches in Charlottesville. Although I have seen alt-righties with Nazi flags giving the fascist salute. Sizing up Drumpf, he is a poor match for President He thought process is adolescent. Drumpf came into office with the preemption he was a dictator, and has had a revolving door of WH staffers. We have a President who constantly lies and has not credibility in Democratic and many GOP circles. Drumpf lacks the native intelligence, especially political, of other modern US Presidents. This situation is made worse by his inability to to use his WH staff effectively. Drumpf has an authoritarian and narcissistic personality in which he is always right. This works poorly in Washington, where compromise rules the day!